Successfully Added Wismec Reuleaux RX2/3 Box Mod - 200W, 510 Thread, 3x 18650 Cell Battery, Upgradeable Firmware, LED Display, Temp Control (White) to your Shopping Cart. 510 thread makes this e-cig compatible with the majority of tanks and atomizers out there. The Wismec Reuleaux RX2/3 is an extremely powerful vape box mod that reaches up to 200 Watt, making it the perfect box mod for all advanced vapers out there that wish to heighten their current vape experience. With its replaceable back cover, this 200W box mod allows you to insert two or three high-rate 18650 cell batteries – providing you with an extremely powerful performance and vaping experience. Besides its powerful hardware, the Wismec Reuleaux RX2/3 furthermore features a durable and highly portable design. Crafted out of a stylish and tough Zinc alloy, this 200W e-cig has been designed to withstand the rough environment of everyday life while, at the same time, staying lightweight and portable. Simply slip it into your bag and you’ll be able to carry along this little beauty wherever you go – allowing you to enjoy a relaxing high-end vape at any given moment. With its 510 stainless steel thread, the Wismec Reuleaux RX2/3 box mod is compatible with the vast majority of atomizers and tanks out there – allowing you to replace your current underpowered box mod by this 200W power horse by simply attaching it to your beloved RTA. Featuring a variable Wattage mode, the box mod lets you reach up to 150W on 2 batteries and a stunning 200W while using three high-rate 18650 cells. Additionally, this powerful vape mod also supports temperature control – letting you select the temperature of your liking and thus allowing you to adjust your upcoming vape experience to your exact personal liking. Its replaceable batteries can be easily charged through the vape mod’s micro USB port, conveniently letting you power-up your e-cig whenever necessary. Running out of juice unexpectantly is, however, not something to worry about with the Wismec Reuleaux RX2/3 as it features a sophisticated LED display on which it continuously shows your battery life, Wattage, temperature and a whole lot more – assuring that you’ll always have the right settings enabled to enjoy the perfect vape. Another fun and extraordinary feature offered by this 200W e-cig is its upgradeable firmware that supports the input of custom logos. 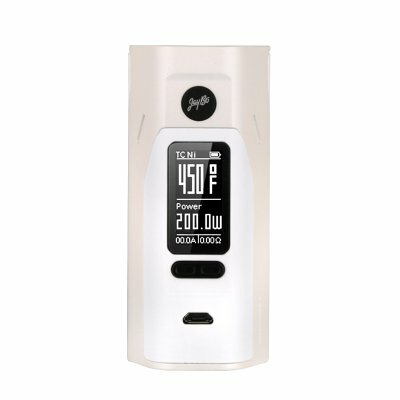 By connecting the device to a computer through the micro USB port, you can download and add custom logos to your Reuleaux RX2/3 that will be displayed on its LED display. Simply attach the Wismec Reuleaux RX2/3 to your current beloved RTA, fill it up with your favorite e-liquid, and you’ll be ready to enjoy the perfect personalized vape experience from your custom built 200W e-cig. With this powerful vape mod, you’ll be able to sit back, relax, and enjoy great flavor during all your upcoming vaping sessions. The Wismec Reuleaux RX2/3 comes with a 12 months warranty, brought to you by the leader in electronic devices as well as wholesale electronic gadgets..
Arabic: - السجائر الإلكترونية 200W - Chinese Simplified: - 200W 电子香烟 - Czech: - Elektronická cigareta 200W - Dutch: - 200W elektronische sigaret - French: - Cigarette électronique de 200W - German: - Elektronische Zigarette 200W - Hebrew: - סיגריה אלקטרונית 200 ואט - Hindi: - 200W इलेक्ट्रॉनिक सिगरेट - Hungarian: - 200W elektronikus cigaretta - Italian: - Sigaretta elettronica 200W - Japanese: - 200 w 電子タバコ - Korean: - 200W 전자 담배 - Malay: - Rokok Elektronik 200W - Norwegian Bokmål: - 200W elektronisk sigarett - Romanian: - Tigara electronica 200W - Russian: - 200W электронная сигарета - Spanish: - Cigarrillo electrónico de 200W - Thai: - บุหรี่อิเล็กทรอนิกส์ 200W - Turkish: - 200W elektronik sigara - Vietnamese: - Thuốc lá điện tử 200W.